I'm happy to announce that this money has allowed for FOUR STUDENTS to make the trip to Parkland! We will be able to take these students to attend a meetup with students and families from Marjory Stoneman Douglas. We will also be able to give these students "Stop The Bleed" training, powered by Make Our Schools Safe ( https://makeourschoolssafe.org) as well as offer a holistic approach to healing after trauma, powered by the Holistic Recovery Center ( https://www.facebook.com/HolistiicRecoveryCenter/). We are very excited to bring this information back and work to implement it in our Southern Maryland community. 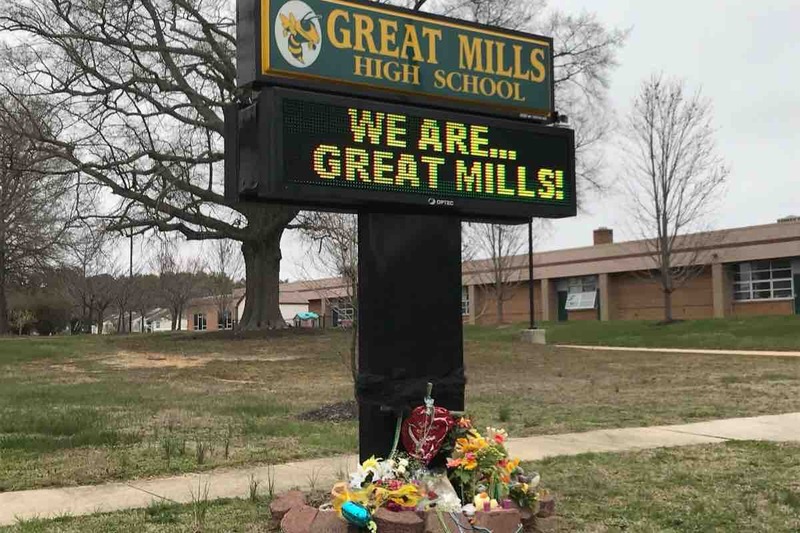 My name is Jaxon O’Mara and I am rising senior at Great Mills High School in Maryland. On March 20th, just 5 weeks after the massacre at Marjory Stoneman Douglas there was a fatal shooting at my high school. Since then, my classmates and I have been doing a limited few things. Grieving, processing, and starting a fight to make sure that no one else has to go through what our community did. Part of what helped us get through the next couple of weeks after the shooting was communication with students from Marjory Stoneman Douglas who had gone through the same thing just 5 weeks earlier. In August, a couple of Great Mills HS Students are traveling to Parkland, FL to pay our respects at the memorial of the 17 MSD teachers and students that were killed, as well as meet MSD students and parents that have been helping us for the past few months. We’re planning to meet with them on Saturday 8/18. Whatever we fundraise will also have to pay for flights, hotel rooms, transportation, and food for the students which can add up quickly. Please consider donating even a few dollars to try and make this possible. It will cost about $500 per student in order to cover airfare, meals, transportation, and lodging. I have set the goal at $1200 in the hopes of flying two GMHS students down to Parkland and covering any expenses that might come up. If we can get enough funding, I would love to take more students (so keep fundraising! Even if we meet our goal!). All funds will be accessed and monitored by my parents, Patrick and Gina O'Mara, to assure that the money is spent only on necessary items and all students will be under parent supervision throughout the trip. The students included will be those who were closest to Jaelynn during her life and those who have been active in advocating for change. We just hit our goal of $2,000 dollars and I am grateful beyond words for the generosity that we have received. This trip is going to mean so much to the students involved and I believe that it will truly be a life-changing experience. I've changed the fundraising goal to $3,000 to try and accommodate​ more students. It costs about $500 dollars per student and the more money we raise, the more students I will be able to bring. To everyone who has donated or shared, thank you from the bottom of my heart. You have no idea how much this will mean to the GMHS students that are able to go. We’ve increased the goal to $2,000 in hopes of including more students. Any money that is left over or not used will go towards the GMHS students that are fighting for change and their Students Demand Action chapter. If you don’t already know, we’ve create Students Demand Action of Southern Maryland (the first chapter in Maryland) to battle gun violence in our community and across the state. It's only about 9 hours after I posted this campaign and we've reached our initial goal of $1,000 dollars. I am truly blown away by the pure generosity of our community. Thank you so much to every single person who donated or shared. I really can't express just how grateful I am. Please continue to share and continue to ask for donations, the more money we raise, the more students we can involve in this wonderful opportunity.